Turkeys are unique birds that can be your best friend, help you earn some cash by becoming your business, become a lip smacking thanksgiving dinner and serve many other purposes. That is the reason you must know about the list of turkey breeds. These birds are huge in size and each breed has a distinct quality of its own. 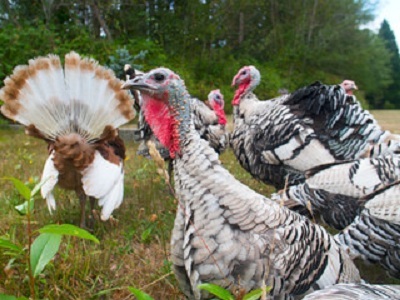 Bourbon red turkeys have their origin in Kentucky and are highly preferred for their tasty meat. They are very curious in nature and closely examine their surrounding area. These calm birds remain underfoot during their feeding time. They tend to go broody soon but can make good hatchers and mothers. These onyx-feathered turkeys are ancient and also known as Black Spanish. They are highly known for their calm nature and virtual self-basting qualities. These turkeys do not have the ability to mate and reproduce on their own. Their meat is juicy and has a distinct sublime flavor to it. This turkey has a striking appearance with its plumage of white and black plumage. This explains why it is raised for show purpose alone. They are aggressive eaters and are too small. The tom birds are very friendly while the females are very good mothers. This large sized turkey bird weighs about 30 pounds (male) and 18 pounds (female) respectively. The meat of the turkey is tasty, juicy, tender and moist and this is the reason it is regarded as one of the best breeds. These birds are quick runners and competent fliers. You don’t require feeding them, as they love foraging for ground insects like crickets, grasshoppers and others. Slate turkeys usually have two distinct genetic mutations, which makes one to be dominant and the other recessive. These turkeys have an ashy blue, lavender or lilac hue with black specks, which makes it beautiful. This is on the watch list of ALBCCP and hence cannot be used for commercial purpose. Midget Whites are new ones among the list of turkey breeds developed in the 1960s. These small birds have good and deep flavors. These breeds are active breeds, good fliers and love to forage for food. This bird is one among the largest one among the list of turkey breeds. These copper hued birds are bred usually for their size and are found commonly in all turkey farms. These birds can breed naturally but are docile in nature. They are less broody but make very good mothers. These breeds are highly popular for their meat. Tom birds weight 30 pounds while the hens weigh 20 pounds. These are calm birds but if you are a beginner, this bird is not a good choice. These birds can brood but sometimes tend to break the eggs owing to their heaviness. This turkey has very short growing time and is bigger sized. They are good hatchers and fine mothers. These birds are not very friendly and expect you only for their feeding. This large sized bird is an ancient one among the list of turkey breeds. These breeds are auto-sexing; they forage for food and are a rare breed.